Official artwork of Marx in Kirby Star Allies. Marx (マルク, Mark) is a character from the Kirby series, and is the primary antagonist of the Milky Way Wishes subgame in Kirby Super Star. He appears as a boss in Super Smash Bros. Ultimate. Marx confronting Kirby in Kirby Super Star Ultra. 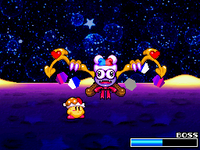 Marx made his debut as a major character in the Kirby Super Star subgame Milky Way Wishes. In the subgame, Marx asks Kirby to gather the power of surrounding stars to awaken the Galactic Nova so the sun and moon can stop fighting. Once Kirby finds and awakes the Galactic Nova, Marx appears and asks it for the ability to rule Popstar. The Galactic Nova grants Marx's wish, causing him to become larger and grow crystal wings. After Kirby defeats him, Marx is sent flying into the Galactic Nova, their impact causing them to explode. In Kirby Super Star Ultra, it is revealed that, after Marx's defeat, his body began to absorb the remaining energy from the dead Galactic Nova, which transforms him into Marx Soul. Marx appears as the final boss in Super Star's subgame The Arena. In addition to these appearances, Marx appears as the final boss in the Kirby Mass Attack subgame Kirby Brawlball, and both as a playable character and a secret boss in Kirby Star Allies. While Marx himself does not make an appearance, a remix of the theme that plays when fighting him in Kirby Super Star, Vs. Marx, appears in Brawl and Smash 4 as a music track. Marx (True Form) as he appears in Ultimate. In Ultimate, Marx appears as a boss at the end of Kirby, Rosalina & Luma, and Inkling's Classic Mode run, as well as in Adventure Mode: World of Light. His battle takes place in the Mysterious Dimension, which is in the Dark Realm. When the fighter gets close, he will teleport some distance away from them. Marx performs the Shooter Cutter, sending out four crescent blades from his body that all circle back to him. He may perform this move twice in a row, a reference to when Marx Soul does the attack. The blades can be reflected or eaten. Marx moves to the side of the screen to charge up and blast a large Marx Laser. This attack deals darkness damage. Marx floats to the top of the screen and drops a large Ice Ball that explodes into two ice balls that spread out horizontally based on the player's position; they freeze the player on contact. It can be reflected or eaten. The ice balls can also be absorbed. Marx flies offscreen and does a Seed attack, dropping five small seeds that disappear into the ground. Large, thorny, plant-like growths will grow upward from where the seeds landed. A shadow appears on the ground and follows the player. After a bit of time, the shadow doubles in size and Marx flies out of it with a Shadow Uppercut. Marx splits in two, opening a Black Hole that will attempt to absorb the player. If the player gets caught, they will take massive damage and get spiked into the ground. Marx often prefaces this attack with multiple teleports from side to side. Marx's eyes go completely black, then black balls come out of them and start bouncing around the stage, dealing darkness damage to the player if they hit. Marx moves to the middle of the screen and retracts his wings, where pink, branching appendages resembling blood vessels or bronchioles grow out instead, spreading across the screen and dealing fire damage to the player. The attack is vertically mirrored. Marx grows large compound eyes that send out multiple laser beams from the eyes. Upon defeat, Marx screams and starts flying around the stage sporadically. His wings break off as he reverts to his smaller form and lands face first on the ground. His body also temporarily alights in a purple flame that simmers out just before the screen fades out. In addition to his boss appearance, Marx appears in the game as a spirit in both of his normal and true forms, while his boss theme from Brawl returns as a music track. His hat is available for the Mii Fighters in the shop. 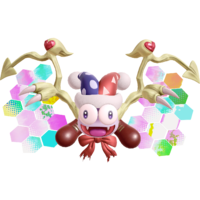 Official render of Marx's jester form from Ultimate. The seeds sprout into tall thorn vines. Marx splits starting the black hole. Marx's hat as Mii Fighter headgear. Marx is the only boss to be fought in Adventure Mode that does not have an area themed after his game of origin. His area appears to be a destroyed variant of various locales in the World of Light, as opposed to Pop Star's moon, on which he is fought in Kirby Super Star. Just like in his original boss fight, players can avoid his giant laser beam by ducking under it. Marx is one of three universe-representing bosses who had not appeared in previous Smash games; the other two are Dracula and Rathalos. Marx is the only first-party boss with this distinction, as Dracula, Emperor of Demise and Rathalos were made by Konami, Futabasha and Capcom, respectively. This page was last edited on April 19, 2019, at 13:04.